LG has already hinted that the LG G5 will be formally introduced at MWC 2016 in Barcelona, having sent invitations for an event scheduled February 21st. 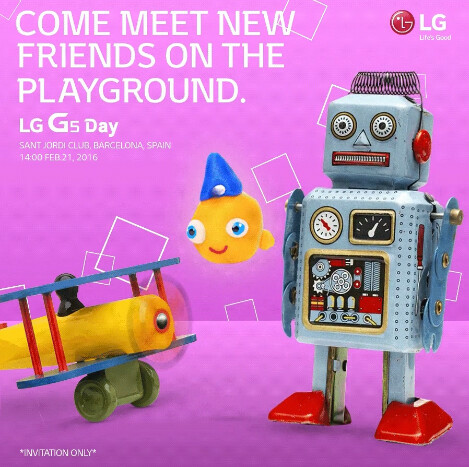 If anyone was having any doubts that the event will bring our first look at LG's first of two flagship smartphones for the year, the manufacturer has now officially confirmed that the LG G5 will make an appearance at the event. While previous LG G smartphones were sub-premium affairs, it looks like the company will pull out all the stops with this year's iteration. Multiple rumors have suggested that the LG G5 will go right for the premium segment of the smartphone market, with one of them claiming that the handset will be aimed to compete directly against the Samsung Galaxy S7, a handset that will be formally introduced the very same day at MWC 2016. According to leaks and rumors, the LG G5 will come with a slightly curved all-metal body (which would be a first for an LG flagship), a 5.5 or 5.6-inch display with a resolution of 1440 by 2560 pixels and minimal bezels, a Qualcomm Snapdragon 820 chipset with either 3GB or 4GB of RAM, a fingerprint reader and a dual-camera setup on the back, as well as side-mounted volume buttons. As always, we'll be present at MWC 2016 to bring you all of the first-hand details about this year's crop of flagship smartphones. Is anyone looking forward to seeing the LG G5 getting unveiled on February 21st? I'm looking forward to the G5 more than the S7. I hope they get away from the ugly UI. "While previous LG G smartphones were sub-premium affairs, it looks like the company will pull out all the stops with this year's iteration." What a load of bollox. The G2, G3 and G4 were quality phones..
Too bad the battery life decreased year after year. They have to increase the capacity on the G5. Capacity is fine. They have to increase efficiency (Snapdragon 820). But really, what makes anyone think that you can make a device with a bigger processor and either drop battery capacity (Apple, Samsung) or keep it the exact same from the G2 (3000mAh)???? That's like saying lets change a cars engine from a 4 Cylinder to a 6 or 8 Cylinder(and add some more horse power), and remove of a few gallons in the gas tank and think no one will notice or complain? Processors are only adding more cores, that's it. Yes, 2.3 Ghz quadcore for example, really just means 2.3 for 5 minutes of gaming or heavy app usage, then it drops to 1.1-1.3 Ghz to save battery and prevent overheating pass a certain temp (like 110F.) Remember when Dual cores came out? Certain phones didn't even activate the second core, and preformed like a single core phone. 3 Months into using my S6 Edge, it is performing just like my S4 did. Lag all around. Like this phone literally gives you less than 1GB of RAM to use...STOCK! Which is another thing. There is so much bloat (I agree, some is pretty cool though, just resource hungry) from the start! I am getting off topic, but I can almost guarantee that if LG does not change the capacity, adding a larger ("but the SD820 is so power efficient" stfu, no one owns a 820 device, so it is IMPOSSIBLE for you to tell me that youre going on faith that Qualcomm is telling the truth. Mind you, they said nothing about the heat issues that came with the 810 when they released in all the flagships. LG SAW THIS ISSUE AND DIDNT EVEN USE IT IN ANY OTHER PHONES PAST THE G FLEX 2, THE V10 AND G4 BOTH CAME OUT WAY AFTER THE G FLEX 2, BOTH HAVING 808) processor will give you the exact same battery life, if not worse than G4 does. I don't mean to go off on you specifically, but more on the people that think efficiency is a real thing. No, tech is not getting better, they are just changing some numbers to confuse people and give you the same performance. They mean materials. The G4 was the sole one to have a "higher end" material by using leather. All the others (including most G4's) were plastic. They never said they were bad phones. To the editors on this site, anything that doesn't have metal is considered sub-premium. To be fair, to the average person plastic simply isn't premium. There's a reason you find very little of it on high-end cars, appliances, accessories, or furniture. Wood, glass, jewels, ceramic, stone, metal, precious metals, leather, and various fabrics like alcantara, suede, or cashmere etc, tend to be thought of as more luxurious and upscale than plastic, nylon and other such materials. True, computers and phones are tools moreso than art. But generally speaking the higher the price tag the more people expect for there to be greater focus on design and feel, alongside performance and feature enhancements. It should perform well and look more expensive than it's cheaper rivals. That isn't something exclusive to Phone Arena, that is true of most humans. After all, if you're spending hundreds of dollars or more on a product, you kind of wanted to look and feel like it. Phones are nearly as much an extension of our personal fashion sense as they are a practical supertool in today's world. That didn't really start with Apple and the modern smartphone, that's something Nokia and other such companies were experimenting with years ago. LG's problems: 1. UI 2. Battery life. Otherwise their phones are basically flawless. I really do hope they change that UI. I used to agree with that statement, but Marshmallow on my G3 doesn't exactly disappoint me at all. Runs smoothly with beautiful UI !! Wasn't their UI was close to Material Design? I was thought most of the user here prefer the Material Design? I just want make LG change those squary boxy icons and a fresh notification panel look.All the rest is great for me. That's true. But it will be better if they wait a week till all the dust settles down after s7 unveiling. But G4 will be unveiled before S7, also, there will be a lot of comparisons right of the bat, so that well get tons of extra PR. If they make the overall better phone or at least in some department, it will be a huge win. Exactly might thoughts. Even if they came up with the better device, the majority of the media's attention will be focused on the S7's announcement. They should've held the G5's announcement atleast 3 days earlier than the S7. Or 7-8 days later. It doesn't matter if G5 is objectively superior to S7. Samsung will still steal the spotlight. The same happened in 2014 to Samsung when iPhone 6+ stole it from Note 4. Samsung acted smartly in 2015 by releasing Note 5 1 month prior. Yes I agree networks play a crucial role, but have in mind that none of the phones will be available the next day so....People will have a lot a time ahead to decide based on a lot of factors....not just the show of the presentation or which presents first and who second. Its the end result of the phones which will make impact and potential buyers to buy or not. Who is HTC..LG is way bigger and has more brand power than HTC. And yet it is not really helping them sell phones. If they include removable battery, it is the s7 that will be overshadowed!